Robyn Penman (PhD, UMelb) is an independent communication scholar and consultant to government on communication and social policy matters. She was a Founding Director of the Communication Research Institute of Australia (1987-2000) and an Adjunct Professor in Communication at the University of Canberra (1999-2005). Robyn is a past President (1985-6) and Life Member of the Australian and New Zealand Communication Association, has served on the International Communication Association board (2002-3) and is a Visiting Senior Member, Linacre College, Oxford (1987-). She was also the associate editor of the Australian Journal of Communication (1984-2003) and has served on the editorial boards of Communication Theory and Human Communication Research. Robyn has devoted her scholarly career to the development of a practical-theoretic approach to understanding communication as a relational practice. 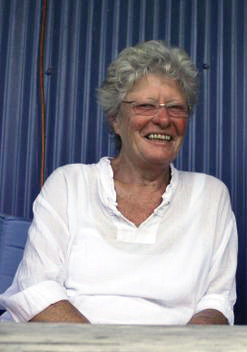 Her practical-theoretic work began with her PhD thesis, published as Communication processes and relationship (1980, Academic Press) and continued with her later book on Reconstructing communicating: Looking to a future (2000, Lawrence Erlbaum). More recently she has argued for a communication discipline that treats the practice of communicating as its central focus in “On taking communication seriously” (Australian Journal of Communication, 2012, 39(3), 41-64). Robyn has focused on explicating an account of how we can make sense of the practice of communicating, while still in the process of communicating, and how we can make judgments about the quality of those practices, while also still in communicating. (eg. “Good theory and good practice: An argument in progress”. Communication Theory, 1992, 2, 234-250). She uses dialogue as an exemplar form of good communicating and has engaged in a range of practical research endeavours to demonstrate the usefulness of her approach and its relevance to important public issues. She has written on public dialogue (eg. “Voices of the Cupertino community, as heard and reflected upon”. In S. Spano (Ed.) 2001. Public dialogue and participatory democracy: The Cupertino community project. Hampton Press) and the importance of dissent (“Making a place for the practice of dissenting”. In S. Banks (Ed.) 2008. Dissent and the failure of leadership. Edward Elgar Publishing). She has also engaged in an extended research program on communicating in courts and its implications for procedural justice (eg “Goals, games & moral orders: A paradoxical case in court?” In K. Tracy (Ed). 1991. Understanding face-to-face interaction. Lawrence Erlbaum). In another practical research endeavour, Robyn has successfully demonstrated how an understanding of dialogue as an exemplar form of good communicating is of direct value in better information design practices, especially as applied to the written word (eg “Conversation is the common theme: Understanding talk and text”. Australian Journal of Communication, 1993, 20, 30–43; and R. Penman & D. Sless. (Eds). 1992. Designing information for people. Communication Research Press). Robyn’s current interests include an inquiry into good communicating in relation to new media and participative democracy. The background for this can be found in her chapter “On being present and participating: Projecting into 21st century media life (In S. Littlejohn & S McNamee (Eds). 2014. The Coordinated Management of Meaning: A festschrift in honor of W. Barnett Pearce. Farleigh Dickson University Press/Rowman & Littlefield). She also continues her broader interest in exploring the quality of communicating in other aspects of public life. Robyn welcomes contact via email. Beginning in the summer of 2013, Fitchburg State University in association with the CMM Institute, will offer a Certificate of Advanced Graduate Study in Interdisciplinary Studies: Coordinated Management of Meaning through a combination of distance learning and real-time workshops and seminars. This is a 36 credit program for post-master’s level students. Students will complete 10 courses for a total of 30 credits and then complete a 6 credit thesis that would demonstrate the ability to apply CMM to real-world challenges. The faculty selected for this program are among the leading researchers in the field of CMM research and application. This certificate will be delivered through a combination of distance/online learning (synchronous and asynchronous) and on-campus workshops and seminars. The Coordinated Management of Meaning CAGS program is a post-master’s academic certificate designed for candidates seeking to enhance their professional knowledge and skills. Graduates of this program may elect to go onto existing doctoral level programs that would support CMM as a research methodology.